An effective networking resource we encourage our custodians to participate in is School Community Councils (SCC), made up of parents, students, administrators, teachers and a school board member. 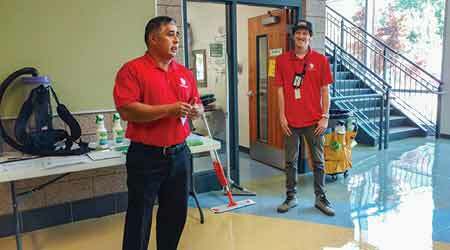 In Salt Lake City School District, every school has an SCC, where our custodians are given opportunities to highlight and answer questions about our innovative cleaning products, processes and equipment. We saw the power of networking when we were testing a new restroom cleaning caddie, green chemicals and a tracking device in one of our middle schools. That school’s custodian was a member of the SCC, and took the opportunity to educate the Council by demonstrating the equipment to them. 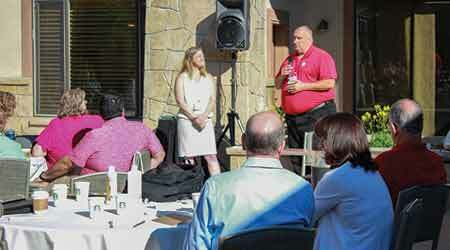 Council members loved it, wanting to know how they could get the equipment and cleaning products into every school. Since you never know who may happen to be in your audience, by seizing every chance to educate, you may discover untapped reserves of support. In this case, one of the parents on the SCC was a grant writer and offered to help the custodial department obtain the funding needed for our equipment. How does a custodian garner respect for themselves? Our leadership team teaches the concept of personal leadership, defined as displaying good customer service and building positive relationships. In my experience as a head custodian, I found that building a positive relationship with your staff, community and students is the most effective way of earning respect and support. How do you build a respectful relationship? As with any relationship, it starts by making a connection or getting to know your customer. In our case, the customer is anyone who comes into our buildings. During our custodial trainings, we stress the importance of making a connection. However, making a connection is not a one-size-fits-all approach. We also encourage them to find their own style of connecting. As a supervisor and a head custodian, I feel this is the foundation of building a positive and trusting relationship with staff, students and community. Each of our custodians has their own, unique way of connecting. To make effective connections, listen to your customer, whether they are an employee, faculty member, student or community member. Be present with those you are engaged with by giving them your undivided attention. Don’t look around or become distracted. Listen carefully to discover answers to questions such as: What happened to make this person upset? What do they want? What can I do to help? Focus on providing a complete answer to a person’s concerns and set reasonable expectations. If necessary, research before responding; this cues the person that what they think matters and that they are a priority.